Here’s beautiful Buddy who recently received his “Assistance Dog” status. You can meet Buddy at the Grapehounds for Greyhounds wine tasting event on Sunday, July 26, from 4 to 6 p.m. at CataVinos Wine Shoppe. The event is a fundraiser for Arizona Greyhound Rescue. 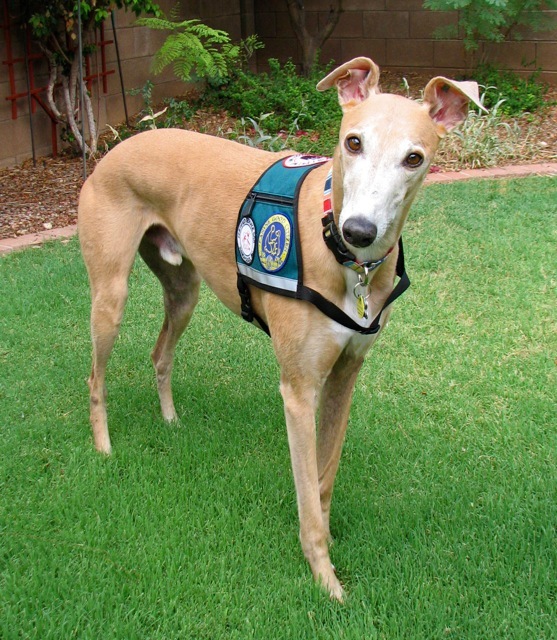 Buddy is a prime example of how greyhounds are more than couch potatoes! Congrats Buddy! How many months/years did you work with your mom to achieve the “Assistance Dog” status? What series of classes did you complete? I’m a new adoptive mom to a retired greyhound. (It’s my first week as a dog owner!) She’s a smart, good girl with a great personality… and I love the idea of teaching her good manners. Please read the next message which talks about Buddy’s training. It took 1 1/2 years and it mentions what classes Buddy took.